More than 1500 Fabric bolts on sale. Sewing Machines - Lowest Price This Year. This week only - More than 100 wide quilt backs are 20% off. 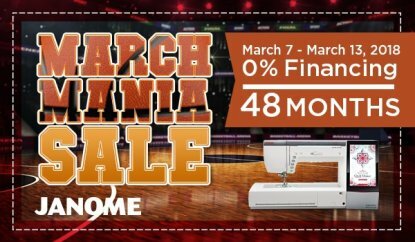 March Machine Mania Financing Special - Last Day! Forty-Eight month 0% financing available to qualified buyers on single item Janome or Elna purchases of $2000 or more. Note the lower price limit. Many top quality Janome & Elna machines are covered by this special. Janome America is being extra generous at this time. Buyers must qualify. Limitations apply. Equal monthly payments required. Come to the store for details. This offer expires on Tuesday, March 13, 2018. Janome Award. 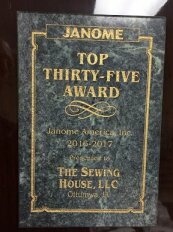 Once again we are pleased to announce that The Sewing House is among the top 35 Janome authorized dealers in the nation. Come See it. We now service all vacuum brands. Embroidery Club - First Wednesday of each month. 10:30 Am to Noon. No Machines Needed. Tips, Tricks, Techniques, Q&A, Show & Tell. Leta Tedrow leads Embroidery Club. Often there is a class after club. Call Leta at 641-919-2340 to get on her mailing list. Embroidery Wednesdays - Machine Embroiderers, come to The Sewing House on Wednesdays and sew with friends. The store opens at 10 AM. Embroidery Consulting - Leta Tedrow does fee-based embroidery consulting at The Sewing House by appointment. Contact her by phone at 641-919-2340. Sewing Club - 2nd Monday of each month starting July 10th. 10:30 AM to noon. No machines needed. Format similar to embroidery club. Leta Tedrow will lead Sewing Club. 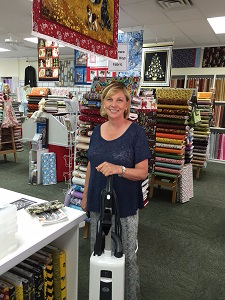 Vanessa Crowe from the Hannibal-Quincy area drove to Ottumwa and purchased a Sebo X4 vacuum from The Sewing House. I asked her why she drove 120 miles to purchase a vacuum. Vanessa replied, "I like Sebo and there is no Sebo dealer close to me. It is easy to use around furniture. It really deep cleans and I can seal the dirt in the bag before I take it to the trash. It does not put dust back into the air. It is quieter than other vacuums. It is easy to use on stairs. And I do not want a vacuum that looks like a popcorn popper." Thanks, Vanessa. The SQUEELS, a quilting group from Omaha, Nebraska, recently enjoyed a quilting retreat at The Sewing House. They stayed in a local motel and ate meals at a friend's home. They quilted from 9am to 9pm for two days. Other groups have stayed in motels and ate meals in local restaurants and/or brought food to the store. 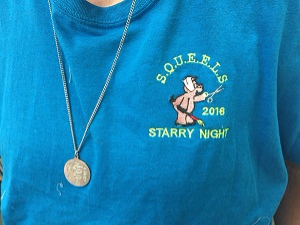 SQUEELS stands for "Scrappy, Quilting, Eating, Eating, Laughing Society." Bring your group to The Sewing House for a retreat. We will help you have a great time. Call for information. 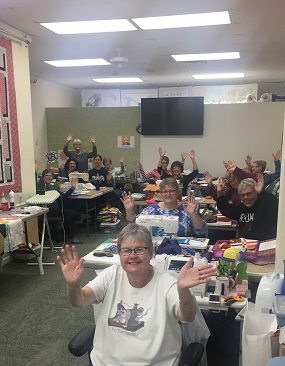 Thirteen quilters from the Grinnell area sewed for three days in our classroom. They experienced door prizes, surprise sales, demonstrations and FUN. They stayed in a local motel and ate at restaurants. One group member brought in chili for one lunch. Your group can also schedule a retreat at The Sewing House. Contact Tim at 641-682-4995 for information. 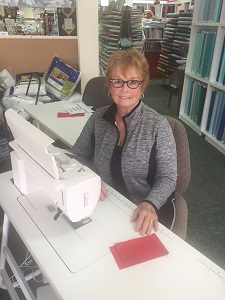 Sharon Walker from Centerville recently purchased an elna eXcellence 780 and sewing table. She shared the following thoughts and gave us permission to use them: "I love the Elna 780 with the sewing table. Now I sew at the proper height and my shoulders do not hurt. My favorite feature is the auto presser foot lift. This sewing machine is a great companion machine for those who own the Janome MC15000." Editor's note: The Janome MC15000 is Janome's Top-Of-The-Line Embroidery/Sewing combo machine. Many 15000 owners keep it set up for embroidery and use the Elna 780 or Janome MC9400 for sewing.